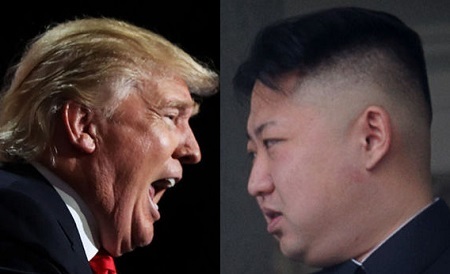 Donald Trump has warned Kim Jong-un that his ‘Nuclear Button’ is ‘much bigger & more powerful’ than the North Korean leader’s. The US President tweeted in response to Mr Kim’s declaration earlier this week that he has a button for nuclear weapons on his table and the entire US mainland is now within strike range. The president does not actually have a nuclear button on his desk. Known as the nuclear ‘football’, it is carried by a rotating group of military officers everywhere the president goes. Yesterday Pakistan hit back over Trump’s tweets describing his New Year’s Day message as being ‘completely incomprehensible’. He said the US had ‘foolishly’ given Pakistan more than 33 billion dollars (£24 billion) in aid in the last 15 years and had received nothing in return but ‘lies & deceit’. He also reiterated longstanding allegations that Pakistan gives ‘safe haven to the terrorists we hunt in Afghanistan’. A statement issued after a National Security Committee meeting, which was attended by Pakistan’s prime minister and the powerful army chief of staff, said the US was making Pakistan a scapegoat for its own failure to bring peace to Afghanistan after 16 years of war.